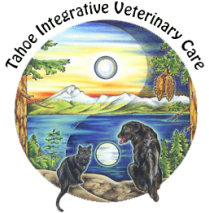 Dr. Robinson is excited to announce a new therapy available to your Tahoe Truckee pets. Dr. Robinson has completed theoretical and practical applications training in Medical Ozone and Prolozone Therapy and has been certified in Ozone therapy through the American Academy of Ozonotherapists (AAOT). Oxygen is normally present in the air as a pair of oxygen atoms ( 02), because this is the most stable way for oxygen atoms to exist. Ozone gas is composed of three oxygen atoms (03), with the addition of the third oxygen atom this molecule is relatively unstable. This unstable quality of 03 gives it remarkable medical properties and can be considered "supercharged oxygen". Ozone is made by passing medical grade oxygen gas (02) through a specialized chamber that breaks up the 02 molecules into single oxygen molecules, which then quickly reassemble into 02 and 03. Ozone was first-discovered in the late 1800's. The first uses were technological, the most common usage being the purification of water. Today, major cities all around the world use ozone to purify drinking water, Ozone has the unique property that literally all microbes are susceptible to its oxidizing powers without the development of resistance. Because of these remarkable antiseptic qualities, it was used successfully to treat infected wounds during the first world war. The wide spread medical use of ozone was first developed in Germany in the early 1950's. Today medical ozone therapy is common throughout Europe and is gradually spreading to the United States over the last 15 years.